The trailer opens with the introduction of Bowser, who is crashing the party. The game will feature a new Bowser Party mode. Two boards are shown: Bowser's Castle; and an underwater coral sea area. New to the series is the ability to play as Bowser, using the Wii U Gamepad to send fireballs at the other players, or to spin a hamster wheel in which the other players are trapped. This amiibo Party board looks like Hungry Hungry... Yoshis? The all new amiibo Party mode showcases the integration of the new Super Mario line of amiibo within the game. Place your amiibo on the NFC sensor on the Wii U Gamepad, and your amiibo becomes your playing piece on the board. amiibo Party boards resemble cakes, which makes you think that you could use your amiibo as cake decorations. Hmm. Just clean off the cake before you put them on your Gamepad. 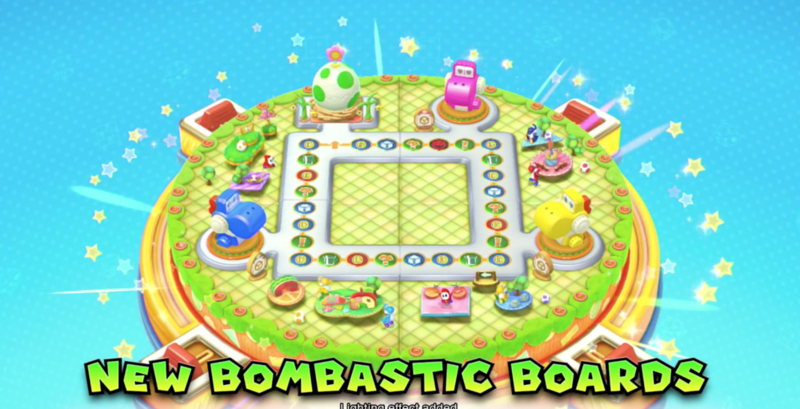 amiibo Party boards shown in the trailer are Mario, Peach, Yoshi, and Luigi's Mansion themed. This one reminded me of Dark Souls. Mario Party 10 looks sharp in HD, and after the disappointment that was Mario Party 9, let's hope it's a return to form for the boardgame/minigame series. Posted on January 16, 2015 by Eugene Huo and filed under News and tagged mario party amiibo dark souls nintendo wii U.